Discussion in 'Reserve/Youth Forum' started by KM, Jul 5, 2018. I'd say Gomes and Chong are more or less nailed on to go. Hamilton also has a very good chance. I wouldn't be surprised if Greenwood and Garner also go with the team. Just for experience purposes. Garners dad already confirmed on twitter that his son is going on tour with the first team. Is it too soon for Lee O'connor and Greenwood? Also if we can include player like Tuanzebe, TFM then they will also be in tour. Good question - I think Gomes and Chong will go not sure about the others. Just searched his twitter account and couldn't find any tweet of that sort. Wow that's very exciting and quite unprecedented I think. How many players have been taken on first team tours with just one year of u18? With the World Cup still on, and the season only about 6 weeks away, the tour will have loads of kids this year of course. I expect Martial to be the main CF, and Sanchez, Mata, Bailly and Herrera will form an experienced core around them. I am particularly keen to see Shaw as the first choice LB on the tour. Yeah, he was class last season. Garner is a nice surprise. He was class last season. I'd be happy with Garner, Gomes, Chong, and O'Connor going and getting good game times. Greenwood would be cool too but also wouldn't mind him just getting a full pre-season with the u23s. Yup. England u17 captain. Plays like Michael Carrick. Kind of hoping Gomes gets called up to the u19 Euros because there will be loads of dropouts for England. Carrick was a lot more dynamic in his younger days too. I wouldn't be surprised if Dalot got a few games at LB. Youngsters going will be mostly midfielders and forwards. Good opportunity for Chong in particular with no obvious name for the right and Garner should get some gametime as we've only really got McTominay and Herrera as midfielders and no 'proper' DM (though Herrera has done fine in that role). 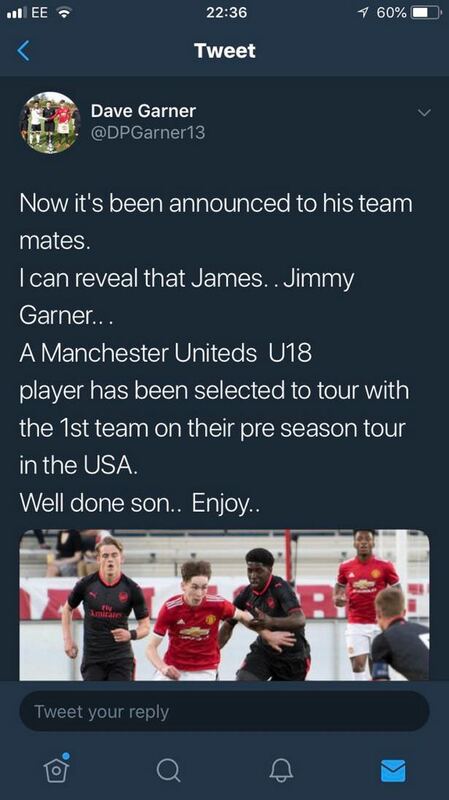 Man Utd pre-season tour starts this month and James Garner appears to be one of the youngsters included in Jose Mourinho's squad. Particularly excited to see Chong of course. I must say that I’m personally not as excited about Gomes as the rest of this forum. Not that’s i don’t think he’s a good player, I just don’t think he’s the nailed on star. While being the England captain at his age, I think there’s a fair few in that age group who are better players. Chong has destroyed everyone he’s played against at every level this season. On Dalot, I would certainly prefer him to not begin his career here as some sort of O’Shea. Let him play RB. Going to be Alexis Sanchez's first Pre-Season in years. Outside the obvious shouts of chong, gomes and O'Connor (and garner seemingly confirmed) it would be amazing to see greenwood too. But probably too soon. Hopefully Gribbin as well, forgot about him earlier. Andreas Pereira, Ander Herrera, Scott McTominay - so we are short with options and beside Garner, I guess Hamilton will be taken as well. Not sure what to think about Willock, Mitchell and Wilson, doubt that they have future with us, but since we have a lot of players that will completely miss tour (Pogba, Lukaku, Fella, Lingard, Jones, Rashford, Young, Lindelof, Fred) we will maybe take some of them. MEN are reporting Gomes, Chong, Hamilton, Garner and most surprisingly Mason Greenwood are all going on tour with the first team. They also say Ro-Shaun Williams and Mitchell will be going. wow, I will be watching this tour with a keen eye then. Great to see these guys getting this experience so early! With us being so light on strikers, not surprised to see Greenwood get a call up. Deserves it for how well he played last season!